We present a unified framework for obtaining black-box constructions of Universal Composable (UC) protocol in trusted setup models. Our result is analogous to the unified framework of Lin, Pass, and Venkitasubramaniam [STOC’09, Asiacrypt’12] that, however, only yields non-black-box constructions of UC protocols. Our unified framework shows that to obtain black-box constructions of UC protocols, it suffices to implement a special purpose commitment scheme that is, in particular, concurrently extractable using a given trusted setup. 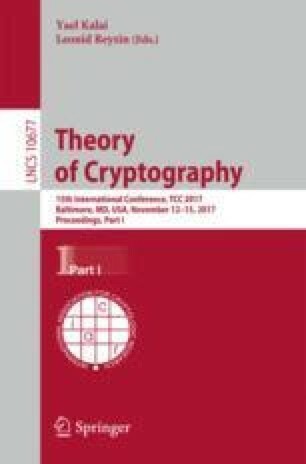 Using our framework, we improve black-box constructions in the common reference string and tamper-proof hardware token models by weakening the underlying computational and setup assumptions. We sincerely thank the anonymous reviewers for their incredibly helpful and insightful comments and suggestions. Huijia Lin was supported by NSF grants CNS-1528178, CNS-1514526, CNS-1652849 (CAREER), a Hellman Fellowship, the Defense Advanced Research Projects Agency (DARPA) and Army Research Office (ARO) under a subcontract No. 2017-002 through Galois. Muthuramakrishnan Venkitasubramaniam is supported by a Google Faculty Research Grant and NSF Awards CNS-1526377 and CNS-1618884. The views expressed are those of the authors and do not reflect the official policy or position of the Department of Defense, the National Science Foundation, the U.S. Government or Google.